After getting my spotting scope repaired, I did a digiscoping test. The CoolPix AW100 is one of the only compact digital cameras I know of that has a filter adapter (40.5 mm). At first I tried connecting this to the SWA AT camera adapter with 2 filter adapter rings (that added a mm or 2 to the distance from camera to scope). I couldn't find an individual adapter ring that went from 27 to 40.5 mm. However, the vignetting was too pronounced. In order to reduce vignetting by getting the camera lens as close as possible to the scope's eyepiece, I got my brother-in-law to screw the plastic AW100 filter adapter directly to the SWA AT camera adapter. This was achieved by boring threading for the screws used directly into the metal camera adapter. In the photo below the Bullfinch was in the shade at a feeder in my yard. I used the 20x magnification of the zoom eyepiece and the maximum optical zoom of the camera (4x). The photo was not cropped. As one can see there is no vignetting when using the camera's optical zoom. 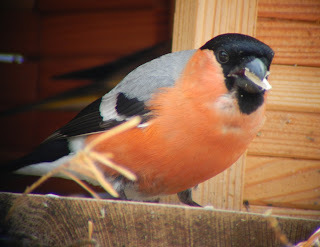 In the following photo the Bullfinch was at a different feeder in full sunlight. I was closer to the subject and couldn't use the full optical zoom because the bird would fill the frame too much. Notice the vignetting. The following photo is the same as the one above except that much of the vignetting was cropped out. Here one can see individual feathers of this songbird and the black eye against the black background. Even using my scope I would not have noticed this level of detail. In the wild it is almost impossible to distinguish this bird's eye from its background. Click on the photo for a larger version. With a little more practice I could probably make fairly good photos with this setup. However, if the bird wasn't relatively stationary at my feeder for several minutes, I'm not sure I could get set up quickly enough before the bird flew away. 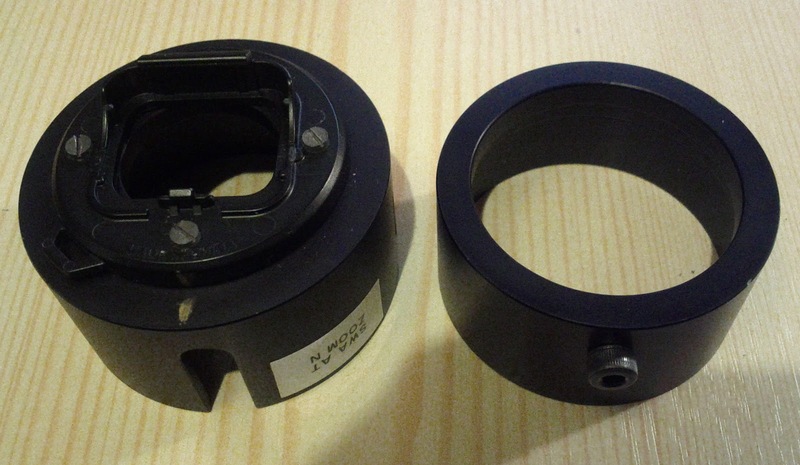 It takes some time to remove the rubber eye cup and affix the first half of the camera adapter to the scope eyepiece with the set screw. The other half of the camera adapter is clipped on quickly to the camera, but this is also its disadvantage: Due to its material (plastic) it sometimes comes off again too easily and might break easily. 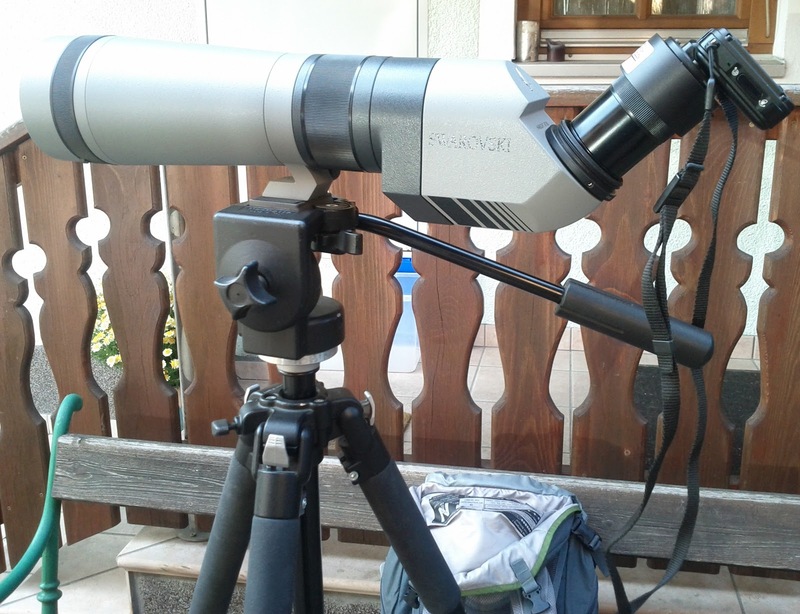 My scope isn't particularly suited to digiscoping since it's not HD. 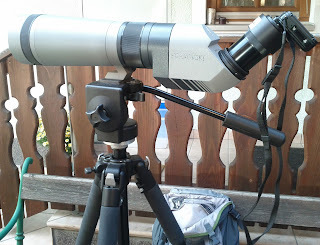 My eyepiece isn't particularly suited to digiscoping since it's not wide-angle. 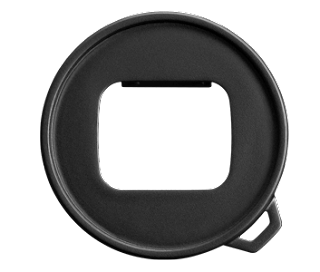 I think the digital camera base (DCB) by Swarovski would be more practical than the type of adapter I'm using, since it swings up and away for viewing and swings back quickly into place for taking photos, but the DCB doesn't fit my older model scope. A different compact digital camera that allows one to do more settings manually might be more suitable. So, except for the tripod, that means exchanging every part of my equipment. I might as well get a new tripod too, since they're lighter these days. What are your experiences with digiscoping? Please comment below.